Avoid the middle of the day in Summer, the glass enclosed boats get warm! the first trip of the day can provide better photo opportunities as boats are generally not fully-booked. We are comparing Amsterdam City Canal Cruise Daytime Prices from leading ticket suppliers and Try to find you Cheap tickets prices on the market. You can take this canal cruise at any time on your chosen day, you\'re not restricted to a certain time of day so long as you take the tour during operational hours – So, if you wake up late there\'s no need to rush, and if it\'s raining you can take the tour later in the day when the weather clears and you\'ll get better photos. 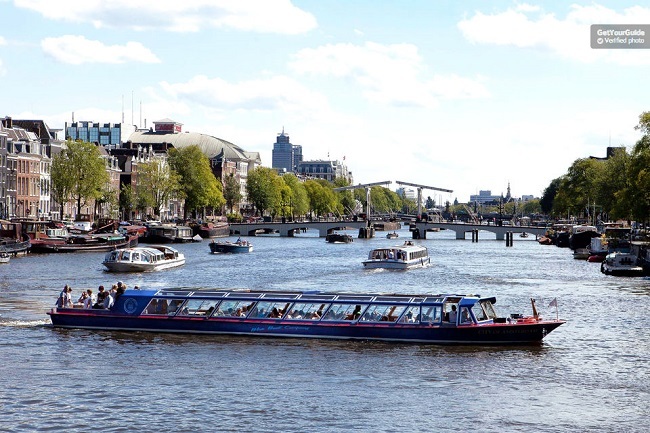 the modern sightseeing boat is surrounded by glass providing you with panoramic views of the historic and beautiful city of Amsterdam. A great cruise for first time visitors to Amsterdam who want to see the city from the water. Good for all types of travellers – Solo travellers, couples, families, friends... also accessible for wheelchair users. Your Experience With Amsterdam City Canal Cruise Daytime? Board the glass boat at your convenience, your ticket not restricting you to a particularly time, and settle down in your seat as picturesque Amsterdam passes by your window. You will pass by the historic centre, see the so called Skinny Bridge, the Golden Bend, pass by Anne Frank\'s house, the Music theatre, and so much more. Take photos of the 17th buildings that line the banks of the canals, dream of owning a house boat, and learn the history of this city that dates back to Medieval times. Audio commentary is available in up to 18 languages via headphones and describes the sights you\'re passing and the culture/history of the city including the Golden Era which so inspired Holland\'s master artists. After the 60 or 75 minute cruise (depending on who you book with) you\'ll be left back at the cruise starting point so you can explore the city more on foot. What Amsterdam City Canal Cruise Daytime Includes? Audio commentary via headphones in up to 18 languages: English, Dutch, French, German, Spanish, Italian, Portuguese, Polish, Russian, Mandarin, Japanese, thai, Turkish, Indonesian, Korean, Hindi, Hebrew, and Arabic. Avoid taking the boat in the hottest part of the day as it can get uncomfortably warm onboard. Travelers Reviews about Amsterdam City Canal Cruise Daytime? Travellers talking about this Amsterdam canal cruise on Viator, GetYourGuide, TripAdvisor, and Tiqets give it good reviews. People say it\'s relaxing, well organized, and the perfect way to see picturesque Amsterdam agreeing that it\'s good value for money too. there are mixed reviews about staff – but audio is via headphones so there\'s no need to interact with staff beyond showing them your ticket. People agree that although the audio is a little repetitive and sometimes it can be difficult to hear due to other people talking around you, it is very funny and most people were entertained by it whilst also being educated on the history of the city. Some negatives included the boat being too hot, people not realising that the windows open until late into the tour, some people not liking the audio but overall, most reviewers were more than happy with this tour, would take it again and highly recommend it to others. Printed tickets are accepted onboard the boats, e-tickets must sometimes be exchanged for a paper ticket ahead of boarding – Check with your booking agent. Check if you can present an e-ticket or if you must exchange it for a paper ticket before going to the boat.